Lou Rinaldi reviews Solidarity Federation's Fighting For Ourselves: anarcho-syndicalism and the class struggle. Fighting For Ourselves: anarcho-syndicalism and the class struggle. 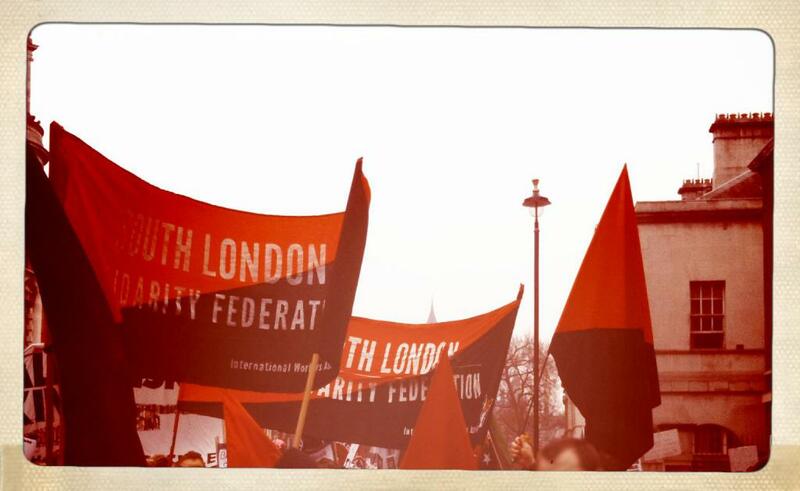 London: Solidarity Federation and Freedom Press, 2012. Paperback, 124 pages, £6. The new book from the U.K.-based anarcho-syndicalist group, Solidarity Federation (SolFed), is an excellent primer on anarcho-syndicalism for those interested in the subject. What SolFed has done is put together something concise and readable that isn’t clotted with jargon and slogans. While the IWW has never been an anarchist organization, SolFed’s form of syndicalism clearly takes influence from the IWW’s work developing a democratic union. To many both in our milieus and out, unions, including revolutionary unions, are an anachronism of the Old Left and the failed workers movements of the past. But for SolFed, the important thing to remember is what has been effective, not for securing our place within the confines of capitalism, but to push beyond them and to not separate our revolutionary politics from our day-to-day organizing. For Wobblies in the shop, we soon find that we can’t hide who we are and be successful. We’re a revolutionary union and we want the abolition of the wage system. We don’t lead every situation with the black and red, but it informs why and how we organize the Wobbly way. SolFed puts forth an analysis of the material conditions that existed previous to the present and how this has culminated into the crisis of today. They focus specifically on the casualization of labor since the late 1970s, and taking astute notes from the past, SolFed puts forward the idea of organizing not only on the shop floor but through grievance-based solidarity networks. Rather than have separate organizations, they believe we should do this work through our own unions. For the IWW, initiatives like this can be seen in the establishment of new commitments to industrial organization like the IWW’s Food and Retail Workers United. Efforts like this will hopefully open up opportunities not limited to a shop-by-shop approach, but a true union for all workers. In this respect SolFed’s book articulates theory and practice already being undertaken by some parts of our organization. One aspect I think is important in this book is its commitment to having politics. In particular, “Fighting For Ourselves” affirms that the practice of solidarity unionism is a commitment to having revolutionary politics. It is our revolutionary practice, and it is the historically most useful revolutionary practice of the workers’ movement. In particular, SolFed advocates that the best aspect of an organization like a union is its associative rather than its representative function. This is one of the most useful political statements that we as a union can adopt. At its very core it means “we are the union,” but it goes beyond this into a broader political argument for shop-floor direct action as opposed to contract fights. For SolFed, and similar to the way the IWW has practiced unionism, the associative function of a union “is the means by which workers relate to one another.” SolFed describes this as the most basic way a union is formed: workers have power together, so they show solidarity together. The other function, the representative function, is when unions become bureaucracies by which workers are represented to the boss. Their critique of this type of unionism is that it believes in the legitimacy of having a class-based society and it often waters down its politics to simply bread-and-butter issues without a larger social program. The IWW does neither. Despite an almost nonstop critique of the IWW, from both Left groupings and the Right—that our failing has been not going for contracts—we can turn this into our strength and SolFed’s book helps us articulate this. They argue that an approach that emphasizes building the union into a representational organization, by mediating labor and management through a contract, actually hurts organizations’ ability to have active and militant memberships. It makes them reliant on bureaucracies and minimizes militancy to the contract. We’ve seen the results in the AFL-CIO. By joining together as workers, on the other hand, that push for a revolutionary politic in our everyday lives, we change the very dialogue on what a union can and should be. Furthermore, we become a more realistic organization, one that understands ebbs and flows of struggle, rather than a number-obsessed party-building union. “Fighting For Ourselves” is a good read that IWW members should consider picking up. Perhaps what struck me the most about it was that despite some disagreements here or there, it presents a call to organize in accessible terms. It took complex systems and broke them down for me. It could potentially become a good educational tool for IWW members, because as we move forward as an organization we need to not just recruit members, we need to create Wobblies. As an organization this means we need to become a thinking organization that is not afraid to have political conversations. “Fighting For Ourselves” is the type of book I would recommend as a follow-up to classics like Rudolph Rocker’s “Anarcho- Syndicalism: Theory and Practice.” I think the two would complement each other well in succession. We should be taking in books like this, as well as other readings, and incorporating them into our educational and organizing practices. Printed materials like “Weakening the Dam,” “Direct Unionism,” and “Dismantling Capitalism, Dismantling Patriarchy,” should all be recommended reading for us. Wobblies should also be interested in learning about our history so that we can move forward. Check out “Black Flame: The Revolutionary Class Politics of Anarchism and Syndicalism” about the syndicalist movement worldwide, or “Truth and Revolution: A History of the Sojourner Truth Organization, 1969–1986.” We all know that you have to think before you act, and so we should. “Fighting For Ourselves” is available from thoughtcrime ink, an IWW printing collective in Edmonton, Canada. Their website is http://thoughtcrimeink.com. Phil Dickens critiques the 'boring from within' union strategy advocated by various left groups.